Animal lovers will find a trifecta of not to be missed attractions in Oregon.In December 2015, I wrote about two of them: Great Cats in Cave Junction and Wildlife Safari near Roseburg. The third is the Oregon Coast Aquarium on the coast in Newport. While some visitors spend two hours at this attraction, I recommend a full day since there is much to see. The Oregon Coast Aquarium is an Association of Zoos and Aquariums accredited institution. Its mission is to have the highest quality aquatic and marine science programs for recreation and education so the public better understands, cherishes, and conserves the world’s natural marine and coastal resources. Founded in 1992, the Oregon Coast Aquarium has been winning accolades since for its exhibits and work in education, conservation, and research. 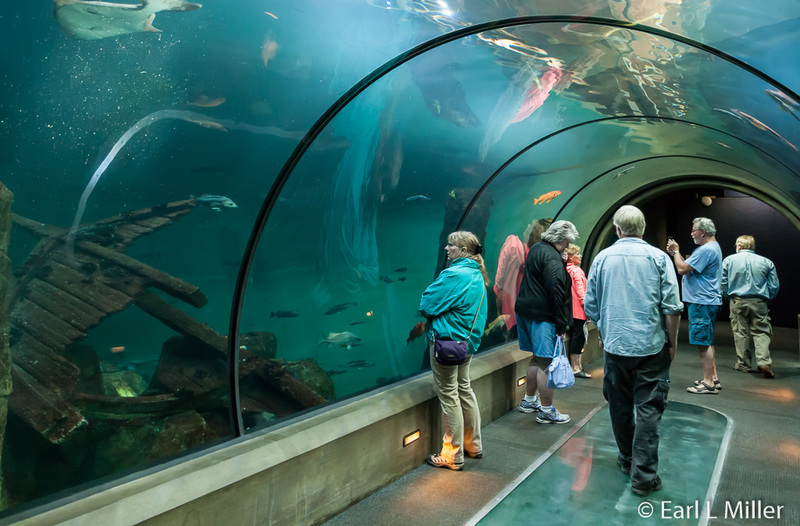 Family Fun and Northwest Travel named Oregon Coast Aquarium the number one family-friendly aquarium in the Northwest. Parents Magazine, Forbes Traveler, and Trip Advisor called it one of the top rated aquariums in the U.S. The exhibits are not just about fish. They also showcase seabirds, marine mammals, invertebrates, and plants, most native to the Oregon coast. These are done through indoor and outdoor exhibits so it is best to dress accordingly and wear walking shoes. 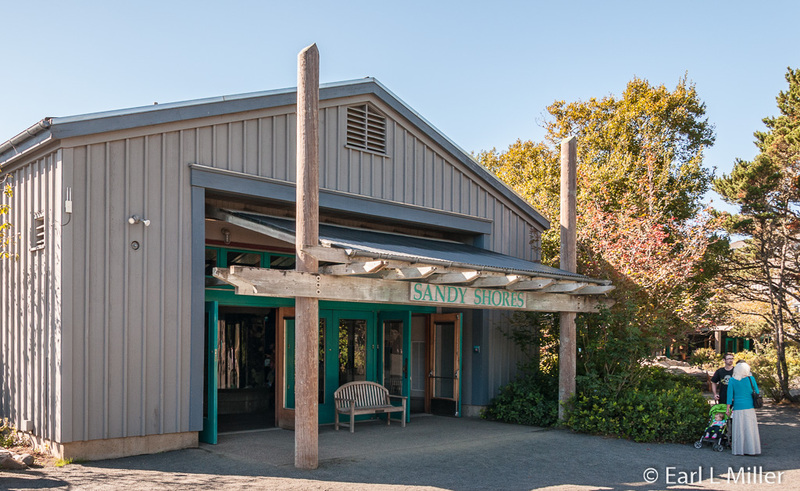 The main building’s indoor exhibits include a temporary area, a theater, and three wings dedicated to Sandy Shores, Rocky Shores, and Coastal Waters. Passages of the Deep is a 1.32 million-gallon exhibit featuring three underwater landscapes. It represents Oregon’s rocky coastlines in the Orford Reef Exhibit, Halibut Flats, and the Open Sea. 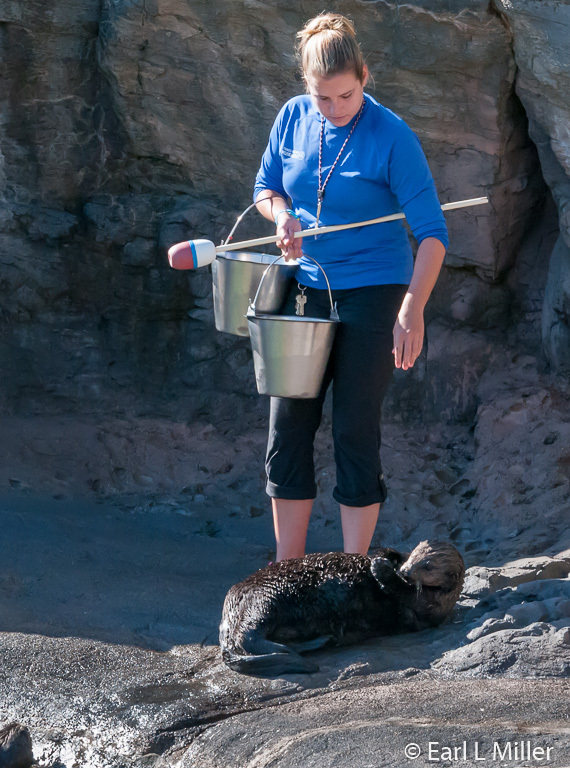 Outdoor exhibits include the otters, harbor seals, and California sea lions. 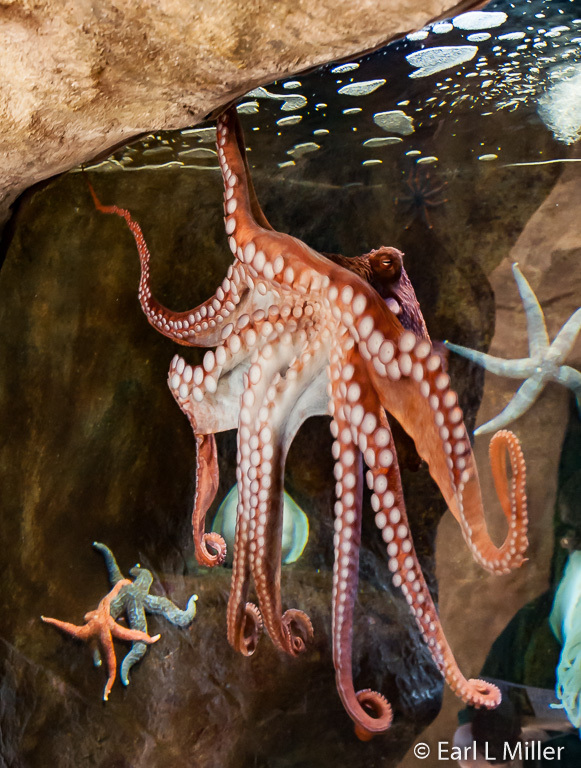 Visitors also see a giant Pacific octopus and turkey vultures. 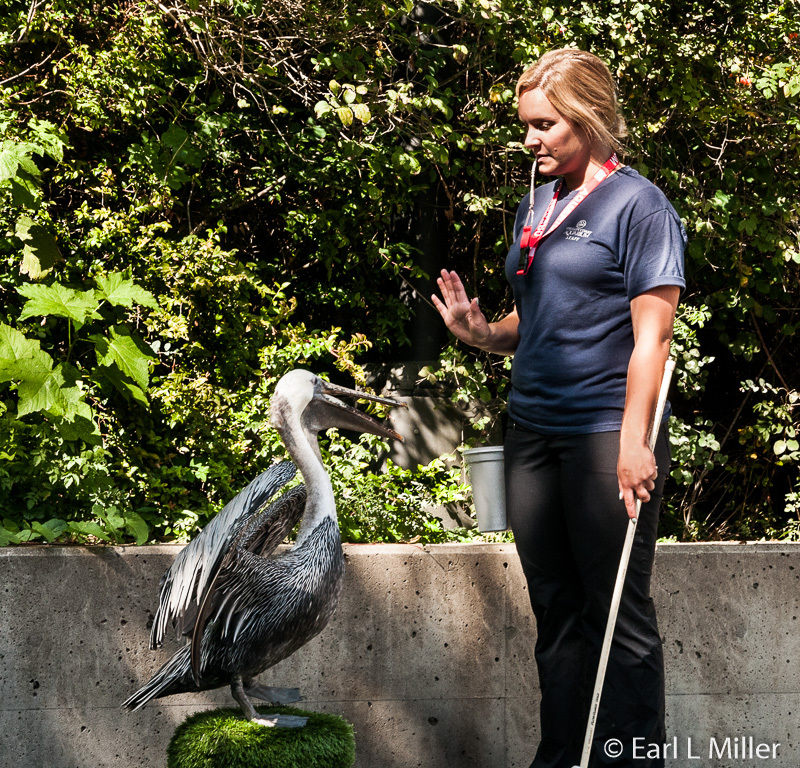 Their Seabird Aviary is one of the largest walk through aviaries in North America. The Aquarium also offers a play area for children, café, two shops, and a quarter mile Nature trail through the Aquarium’s gardens with three viewing decks. You will find 15,000 specimens representing 259 species at the Oregon Coast Aquarium. Check on the web site under Exhibits for detailed information on various plants and animals. You can reach that information on the exhibit portion of their web site. Now that you have an overview, let’s take a closer look. Secrets of Shipwrecks, Part History, Part Mystery, a temporary exhibit, opened May 23, 2015 and will run through at least 2016. In four galleries, it celebrates marine archeology while providing an education experience about all its aspects. 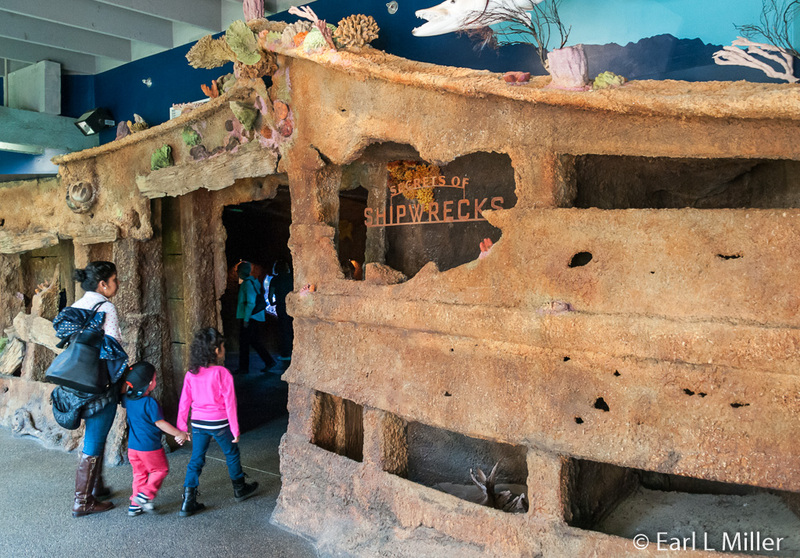 Visitors take a journey through the representation of a life-sized shipwreck, archeological digs, and the artificial reefs that shipwrecks from around the world create. We learned that the United Nations estimates there have been three million shipwrecks around the world. The rate of their decay depends on whether the wreck has been in salt or fresh water. Salt water decays the shipwrecks faster. “Inside a Shipwreck” features the RMS Rhone. A tropical reef, with a variety of corals surrounding it, provides a habitat for cardinalfish, boring clams, and clownfish. It gives visitors a glimpse into the seascape that technical divers and shipwreck explorers might encounter. 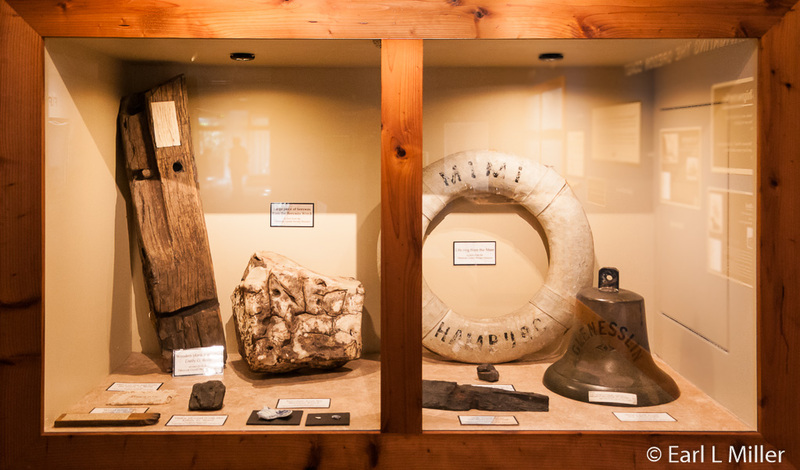 “Oregon’s Sunken Ship” tells the stories of four wrecks off the Oregon coast and includes actual artifacts from each including a ship’s bell, a lifesaver ring, coal, porcelain, and beeswax. This section also contains the biographies of accomplished aquatic archeologists: Honor Frost, Peter Throckmorton, George Bass, James P. Delgado, and Deborah Carlson. “Underwater Archeology’s Tools and Techniques” explores the tools and techniques of this science. Interactive airlift retrieval systems and water jets let visitors play with the tools of this scientific trade. Visitors will see tanks filled with tropical marine life punctuated by replicas of artifacts found in the Caribbean and Red Seas. Among the marine life are Atlantic tarpon. Take time to view the two films in the theater. Galleon Shipwreck was our favorite. It relates the story of a 1600's shipwreck of a Spanish galleon carrying Chinese porcelain and 75 tons of beeswax. Beeswax was a valuable commodity for Spain as a material to create candles. The ship had departed from the Spanish colony in the Philippines and was bound for Mexico. Archeologists are still not sure whether it was the Santo Cristo de Burgos or Santo Cristo Javier. It’s a 15-minute film shown on the hour and 30 minutes past. The beeswax and porcelain visitors see in the Shipwreck exhibit are artifacts from this shipwreck. Protection of Underwater Cultural Heritage describes how technology has made archeology more accessible. It points out how it’s important for nations to cooperate to preserve sites even beyond their 12-mile territorial sea borders. That is because underwater cultural legacy heritage is part of humanity’s legacy. It lasts 11 minutes and is shown at 15 and 45 minutes past the hour. Next door to Shipwrecks are three rooms that deserve attention. Sandy Shores showcases the ecosystem where land meets water along the Oregon Coast. It allows for an appreciation for life in the sand and the shorebirds and animals that roam this area. Its exhibits include a freestanding pier pilings exhibit. 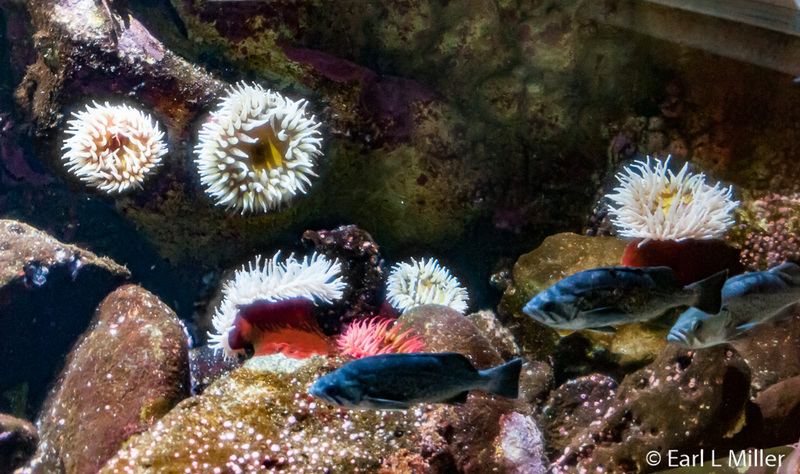 Its 4,730 gallon tank is home to anemones, mussels, and Dungeness Crabs. One display replicates the constant ebb and flow of the surf against a tidepool filled with anemones, sculpins, and oysters. Another displays the natural habitat of the Sea Pen with its curious-looking flatfish. Flatfishes are masters of deception and can change their color to meld in with the environment such as sand. Amongst the touch tanks is a tank showing wave action while signboards describe how a beach is built. A highlight is the Ocean Today kiosk using videos and interactive programs to relay updates on weather and conservation issues from throughout the world, courtesy of the National Oceanic and Atmospheric Administration (NOAA). In all, there are 13 exhibits in this gallery. Oregon’s coast is known for its rocky shores which provide habitats to countless species of animals and plants. During the day’s two high tides, cold seawater is sent crashing onto the rocks which collects in pools in the rocks. During a low tide, the rocks steam dry in the sun. Plants and animals must be adapted to survive both the cold water and the hot sun. They also need to cope with predators ranging from seabirds to shore animals such as raccoons or otters. To deal with these challenges, many are covered in hard shells, have elaborate camouflage, or are armed with stinging cells called nematocysts. This area’s 15 exhibits included habitats for the wolf eel, rockfish, and a wide range of sea stars, limpets, and other invertebrates. 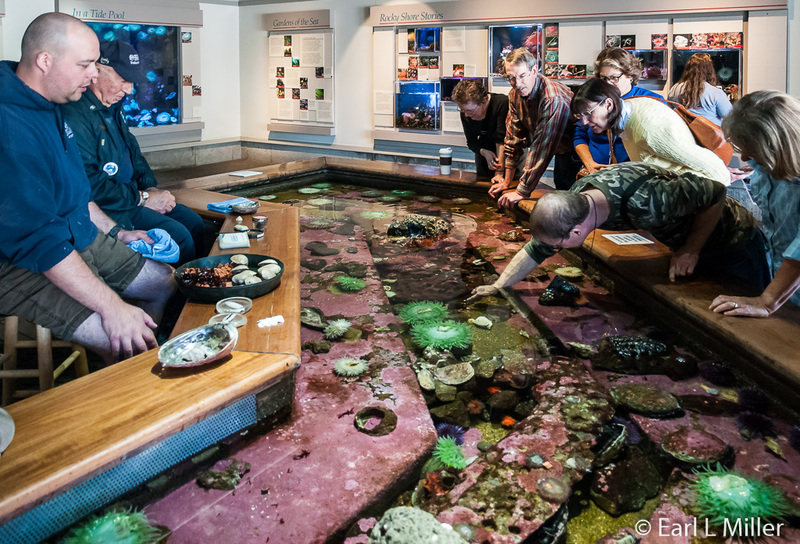 Its centerpiece is the Touch Pool where visitors can interact with such tide pool residents as sea stars, anemones, sea urchins, abalones, and crabs. At 1:30 p.m. on Tuesdays and Fridays, you can observe a Touch Pool feed. The third room is Coastal Waters. Its “At the Jetty” exhibit replicates the habitat of the Yaquina Bay jetties between which salmon must pass through during their annual migrations. It concentrates on survival issues of Coho and Chinook salmon. The exhibit explains their life cycle and the arduous journey from streams to the ocean and back again. The 35,000 gallon exhibit is one of the Aquarium’s largest indoor displays. 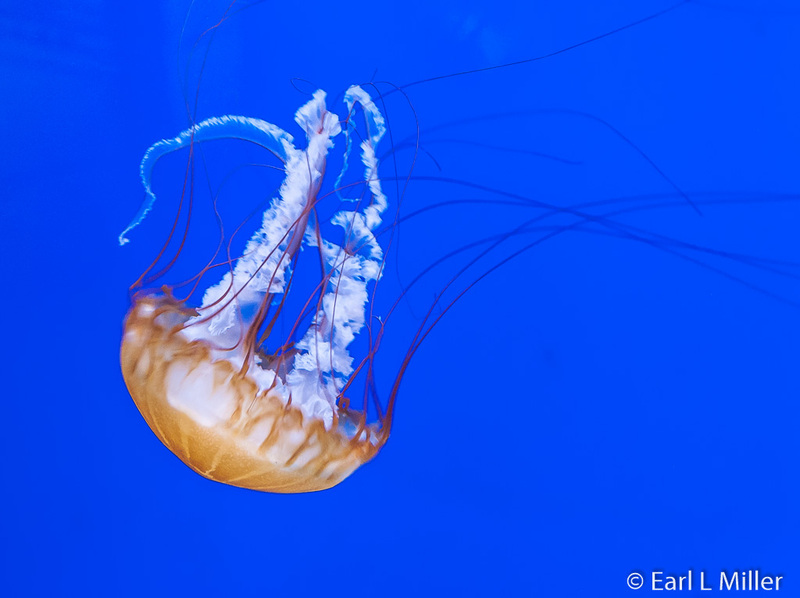 The three tanks of jellies are very popular with Aquarium visitors. One is a moon jelly display occupying an acrylic cylinder eight feet in diameter. A second features Pacific sea nettles. You’ll find tanks of hagfish, kelp greenlings, and sponges as well as a huge tank housing various types of rockfish. Look for the 5,000 gallon kelp forest harboring offshore fishes and the 9,100 gallon coastal reef exhibit. Kelp is a giant species of seaweed that can grow 14 inches in one day. It’s less common off of Oregon. You can see more of this plant from California to Mexico. In all, this gallery holds 16 exhibits including one explaining the California Current. You’ll also find information on commercial fisheries including Oregon’s Pink Shrimp Fishery. That was the first shrimp fishery in the world to be certified by the Marine Stewardship Council as a well managed and sustainable fishery. Feeding at Coastal Waters occurs at 10:45 a..m., every Tuesday and Friday. In another section of Oregon Coast Aquarium, you’ll find more fascinating interior exhibits. 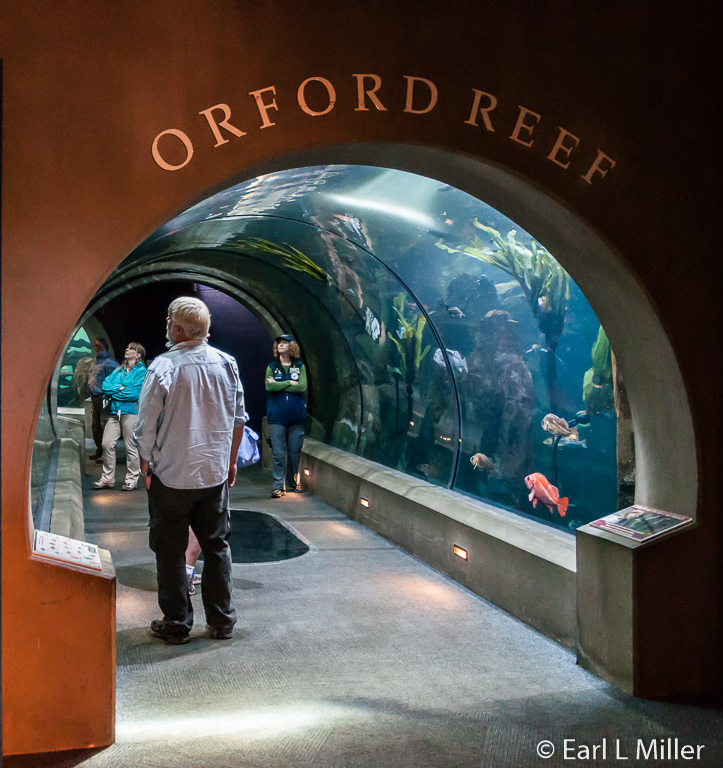 It’s designed for guests to view the changing underwater landscape, starting with Oregon’s rocky coastlines in the Orford Reef Exhibit, through Halibut Flats, then to the Open Sea Exhibit resembling an ocean environment far offshore. You explore these by walking through a series of connected tunnels, for 200 feet. As you pass through the three ecosystems, you symbolically move further into the Pacific Ocean. You actually feel like you are walking beneath the sea. Orford Reef is located just offshore near Point Blanco. It’s a cluster of submerged haystack rock formations where only the tops are visible above water. Beneath the waves, areas between these rocks form a deep reef with narrow crevasses and kelp forests reaching lengths up to 100 feet. One of the most predominant fish at the reef is the Rockfish of which there are 60 different species. 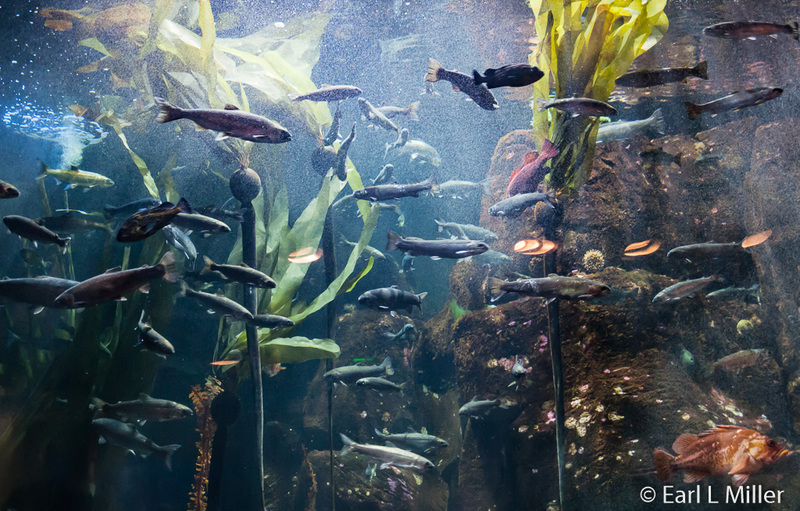 At the Aquarium exhibit, it’s the home of kelp, anemones, wolf-eels, rockfishes, and scholing surfperch. A machine, in this display, creates a surge above giving visitors a feel that they are in a swaying kelp forest among submerged basalt boulders. In Halibut Flats, the sunken skeleton of a long-forgotten ship provides shelter for ocean life. Since there is more sunlight than at the reef, animals are more active. Sturgeon, lingcod, rockfish, halibut, and flounder patrol the shipwreck. The sandy ocean floor is the location for skates, a disk-shaped species related to sharks and rays. Open Sea is the longest tunnel in Passages of the Deep and represents the world’s largest environment - the Open Sea. Most of the species in this display live in the upper strata of water called the Sunlit Zone. This 875,000 gallon exhibit is where you’ll find five species of sharks native to Oregon coastal waters and huge bat rays. The largest specimen is the Broadnose Sevengill Shark. You’ll also find schools of anchovy, salmon, and mackerel. Divers may want to participate in the Dive the Aquarium program which permits certified scuba divers to plunge into Passages of the Deep exhibits. This allows visitors the opportunity to swim with animals native to the Pacific Northwest marine environment. Professionally trained dive guides will lead. 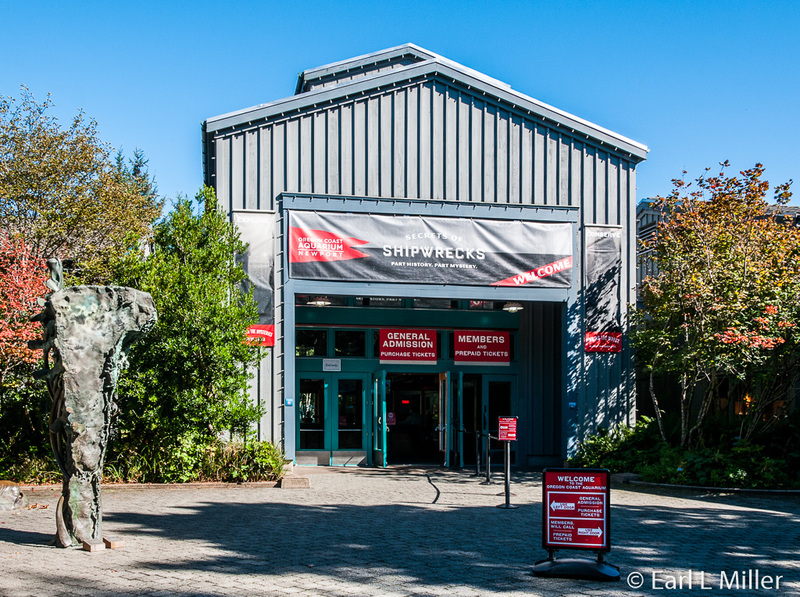 Aquarium admission, a behind the scenes tour of Passages of the Deep, and a photo are included. Program cost is $139. Reservations are necessary. More information is available on the Oregon Coast Aquarium web site. You’ll want to spend time at the outside exhibits. They consist of the Aquarium’s sea otters, harbor seals, California sea lions, a giant Pacific octopus, turkey vultures, and the Seabird Aviary. 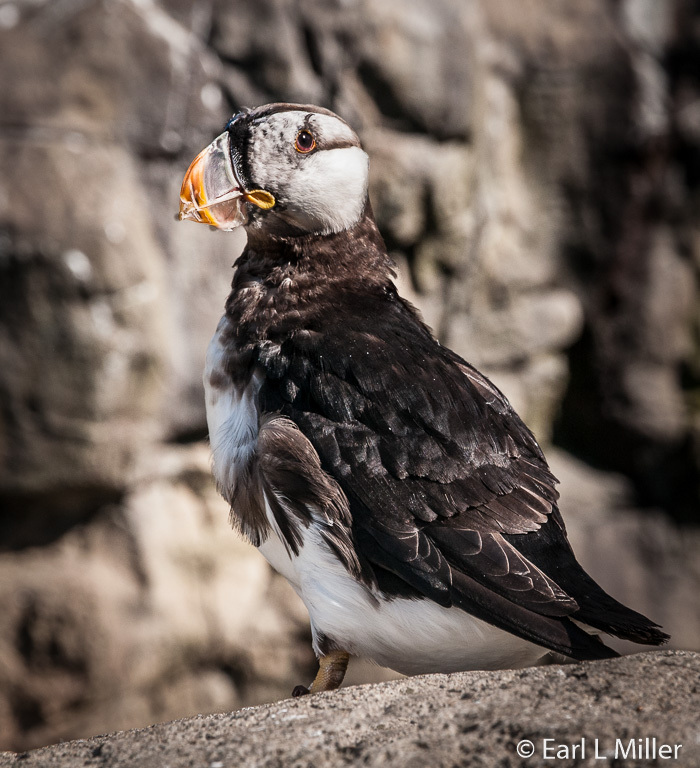 The Seabird Aviary, one of the largest in North America, exhibits a shorebird (black oystercatcher) and five seabird species (tufted puffins, horned puffins, common murres, pigeon guillemots, and rhinoceros auklets) native to the Oregon coast. Erin Paxton Miller, public relations coordinator and our guide around the Aquarium, told us that the Tufted Puffins are visitor favorites particularly when they have their intense coloration during the summer. 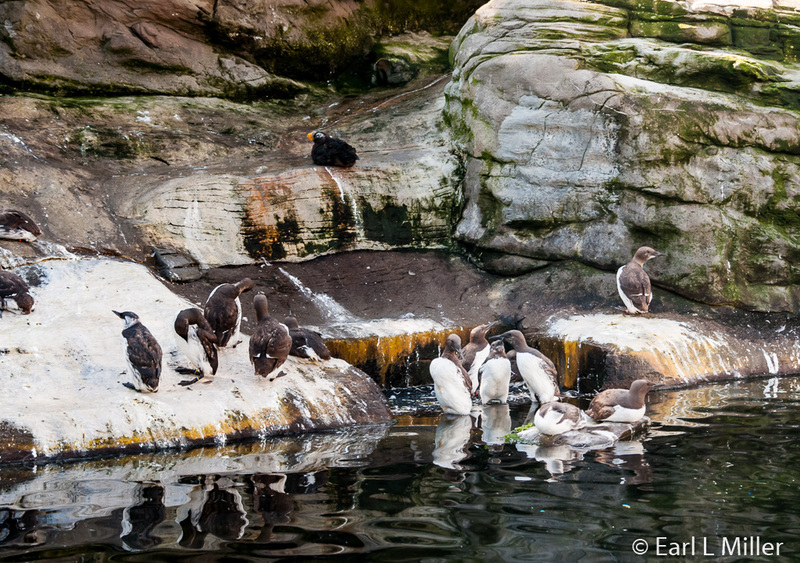 The Aviary includes a 30-foot rocky cliff above the north pool with ledges and walkways to allow the birds to rest, groom, and fly from the cliff’s face. It has an underwater viewing window. A rocky bank, outcrops, and landscaping ring a shallower south pool on three sides. This area provides built-in burrows in the rock and smaller nesting boxes for the various bird species. The one species of shorebirds, the Black Oystercatchers, live in rocky intertidal areas. Instead of diving for fish, they chisel limpets, crabs, and mussels from tide pool rocks and break them open with their beaks. They are more graceful flyers than the heavy-boned, diving seabirds, and are very vocal. They use a series of shrill whistles and calls to communicate with each other. They have deep red beaks and black feathers that don’t change throughout the year. At 2:30 p.m. daily, an Aviary Feeding takes place. We saw the Pelican Presentation at 11:30 a.m. where Wren and JoJo performed. They learned behaviors through positive reinforcement. Wren dove feet first for a fish then revolved in a circle both ways. JoJo also revolved. Other behaviors they demonstrated were touching their beak to the end of a pole, following the trainer, hopping up on a stump, and waiting. We learned pelicans take turns incubating the eggs. The male selects the nesting site then the female builds the nest. The turkey vultures, Ichabod and Olive, are siblings. They came to the Oregon Coast Aquarium through unusual circumstances. They were taken from their nest as hatchlings into a human home. Shortly thereafter, the birds were turned over to wildlife rehabilitation specialists to provide the care they needed. This resulted in their imprinting on human beings so they were unable to be released into the wild. The Aquarium became their permanent home in 2009. 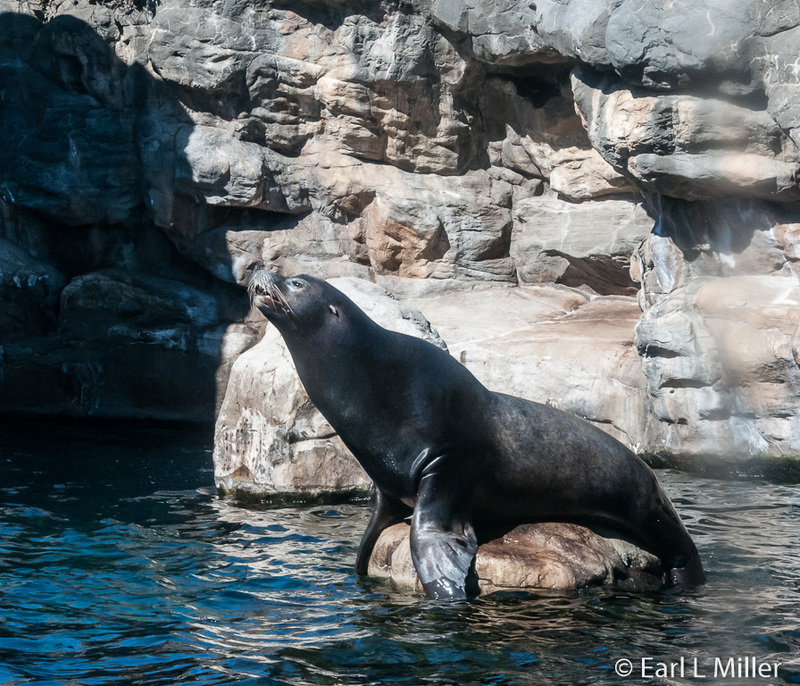 Both harbor seals and sea lions are known as pinnipeds. The two species look very similar, particularly when they are in the water. Sea lions are longer, sleeker, and have large front flippers and a hinged pelvis which help them navigate on land. They’re light to dark brown when dry but appear black when wet. They have small external ear flaps and a dog like muzzle with long stiff whiskers. They’re very common in Oregon. They’ve taken up residence in Yaquina Bay with their bark often heard from miles away. Harbor seals are smaller and more “sausage shaped.” Their coloration ranges from near white to black but usually it’s bluish grey with white spots and small rings. They have no external ears. They have short front and rear flippers and aren’t as vocal as sea lions. You’ll find populations of them in Coos, Alsea, Yaquina, Siletz, Netarts, and Tillamook Bays. They dine on herring, salmon, and anchovies. Larger predators like Great White Sharks and Orcas hunt them down. They are protected under the Marine Mammal Protection Act. At the Aquarium, you can learn about their behaviors and see them fed daily at 11:00 a.m. and 3:00 p.m. We attended both shows and were introduced to Max, Lea, and Quill, three California lions in the 25-26 age range. Koa is the youngest at nine years old and the newest addition to the Aquarium. They showed such behaviors as bowing, giving kisses, waving, clapping, barking, and catching a fish in their mouths. We also met the eight harbor seals. The oldest is Skinny, age 40. They had a birthday party for her last June including ice treats with fish in them. At the afternoon show, the trainer worked with Max. She touched his back, had him lie down and roll over, follow her around, and raise his flippers. 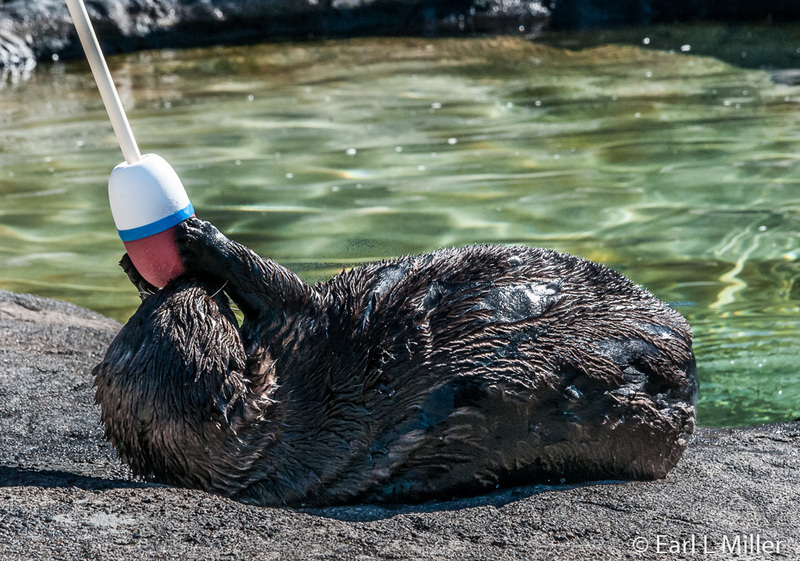 The most popular mammals at Oregon Coast Aquarium are the four otters. All are males that were found as abandoned pups along the coasts of Alaska and California. Nuka is a Northern Sea otter. Judge, Schuster, and Oswald are all Southern Sea otters. You can see them fed and go through their antics at 10:30 a.m., 1:00 p.m., and 3:30 p.m. daily. The Aquarium has one of the largest otter exhibit areas in North America and the largest population of sea otters in Oregon. While attending this show, you learn because of their very dense fur, trappers almost made the animal extinct. That has had an effect on maritime conservation. Otters dine on sea urchins which feed on kelp. With the decline of otters, sea urchins were no longer controlled, and the kelp population was decimated. Otters are now federally protected. Oregon no longer has otters in the wild. Instead, they are found in Washington, Alaska, California, and Russia. The 20-minute talk on otters also included ways people can help. Suggestions were to pick up plastic and dispose appropriately of oil. 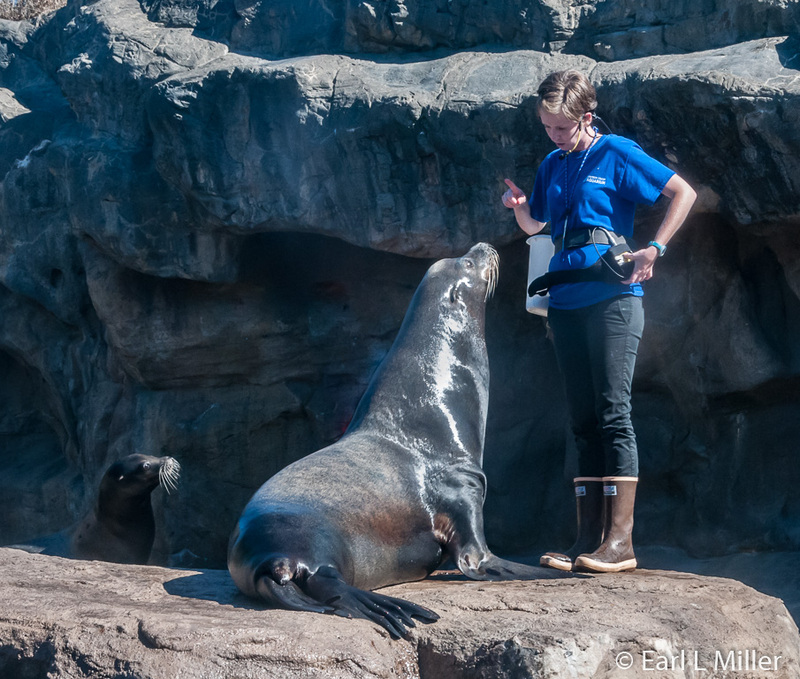 For those who want special experiences with the animals, opportunities exist to kiss a seal or a sea lion or shake suckers with a giant Pacific octopus on behind the scenes tours. Sleeping with the shark during an Aquarium sleep over is also available. If you prefer, you can take a behind the scenes tour to explore the ins and outs of caring for the animals. All of these have extra fees and require reservations. 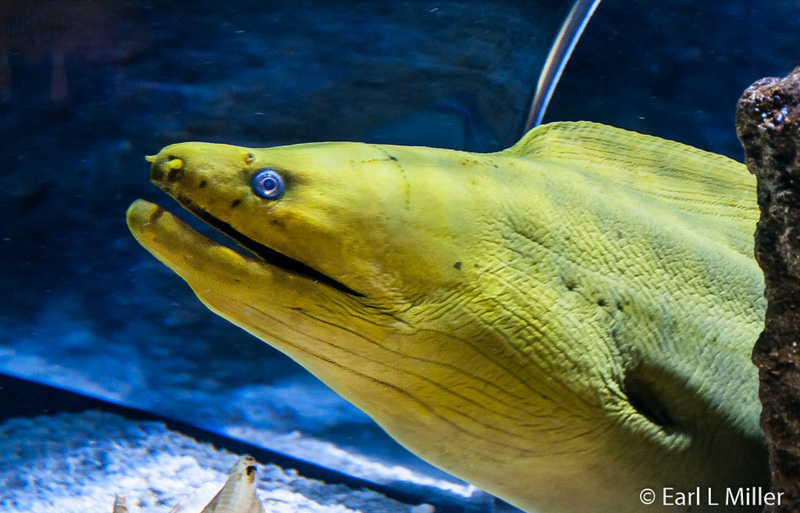 For more information, go to http://aquarium.org/animal-encounters-and-tours. The Oregon Coast Aquarium is located at 2820 SE Ferry Slip Road in Newport. Its telephone number is (541) 867-3474. Admission is $19.95 for adults, $17.95 for seniors ages 65+ and for young adults ages 13-17, $12.95 for children ages three to 12, and free for those under age three. Show your AAA card for a 10 percent discount. Parking is free. Strollers, scooters, and wheelchairs are available to rent. The Aquarium is open every day of the year except for Christmas. From Memorial Day weekend through Labor Day, the hours are 9:00 a.m. to 6:00 p.m. During the winter hours, which is the rest of the year, the hours are 10:00 a.m. to 5:00 p.m.
You can purchase lunches at the Ferry Slip Café located in the Aquarium’s main lobby. All entrees are less than $9. It’s open Wednesday through Sunday from 11:00 a.m. to 3:00 p.m. during the winter hours and 9:00 a.m. to 6:00 p.m. daily during the summer. The Ferry Slip Café Coffee Bar serves drink and snack choices. 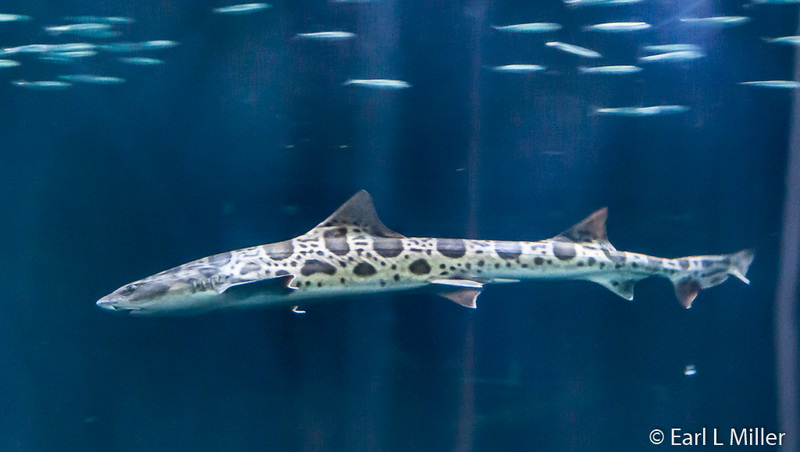 It’s also in the main lobby and is open daily from 10:00 a.m. to 4:00 p.m.
Shark Territory, offering shark-related merchandise, is located at the end of the Passages of the Deep tunnels. You’ll find The Aquarium Gift and Book Store, carrying a wide range of ocean related goods, in the main lobby. Artifacts in the Section "Oregon's Sunken Ship"